The three scents are basically the three ultimate home scent brands – Diptyque, Jo Malone and Neom. All three really do home fragrance so perfectly and each have that little something special that makes them well worth splashing out on over cheaper versions. All three fragrances are also pine ones – each unique but that familiar Christmas tree scent is unmistakable. I love the pine scent for Christmas as it manages to be perfectly seasonal and festive at the same time as not feeling too heavy as pine is quite a fresh scent. 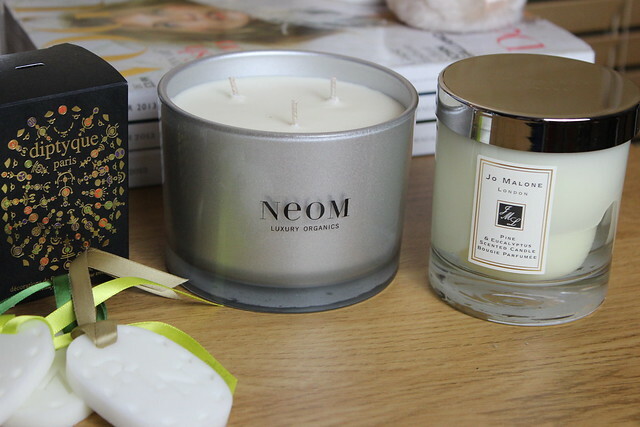 As I type this I have the Neom one burning by my side just to remind me what I’m talking about. Neom have some great Christmas scents on offer – this is the Christmas Harmonise candle which comes in a pretty cool silver colour and is described as ‘a crisp winter walk’ – which sums it up perfectly. They also have the Christmas Wish range (with the ‘waft of Christmas baking) and the Comforting Range (a quiet night by the fire feeling content). 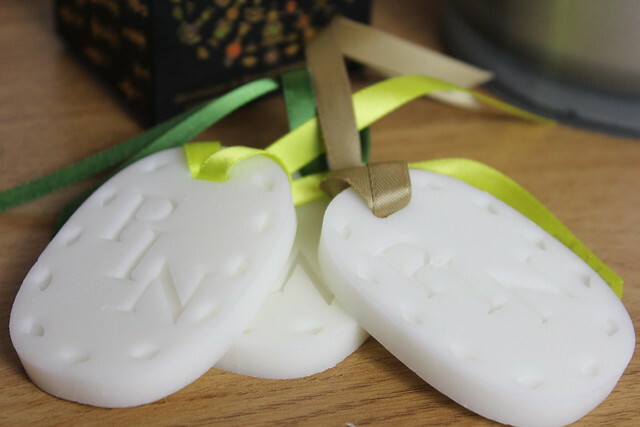 Along with the Neom Candle there’s the little wax, pine-scented ‘tree ovals’ – I’ll be honest and say I was a little baffled by these…they’re wax, they smell of pine…you hang them on the tree…which is great if you have a fake one maybe as it could help give that genuine Christmas feeling…but if you have a real tree is perhaps unnecessary? I’m also not totally sure I get the whole wax hanging thing – don’t get me wrong, these are very pretty and smell amazing. But I’m just not sure it makes sense to me. Perhaps I’m having an especially blonde day today… but regardless, these smell fresh and festive of pine and will be adorning our (fake) tree this year (I do prefer a real one but with rabbits it doesn’t work so much as they just try to eat it…). But I now have three of these delicately hung on the tree and I hope that when I close my eyes I’ll be able to kid myself that it’s a real one…! For Christmas candle scents this year Diptyque have three offerings – Pine Bark (my favourite), Orange Chai, and Indian Incense – and they all come in gorgeous coloured glass holders with beautiful versions of the usual oval brand logo – the packaging this year really steals the show. Then I also have the gorgeous Jo Malone Christmas offering – Jo Malone really does nail the whole ‘lust worthy’ Christmas item. I don’t know a girl who wouldn’t be over the moon to open a cream and black box on Christmas day (FYI I have one of their classic fragrances on my wish list for Santa this year myself) and their Christmas range always manages to just perfect that luxe Christmas feeling. This year it’s all about the Pine and Eucalyptus range with the scented candle being the perfect home version for this. This is the freshest – and one that for some reason I imagine that if you have a bit of a winter cold then it would be the perfect choice, the pine and eucalyptus really work perfectly together and where the Neom candle that has something in there that feels a little warmer with the pine scent, the Jo Malone offers one that’s cool and fresh. Basically I’m on a mission to make my whole flat smell like a real Christmas tree… do you have yours up yet?! I am totally in love with the Jo Malone Pine & Eucalyptus range! Massively dreaming of the Luxury candle in that scent. Not sure I’ll ever get one though! I’ve actually never tried Yankee candles! Which scents do you love as need to try one!